What Does Melting Snow Means for your Home? As spring continues to approach, all of that winter snow is slowly but surely making it’s exit. There are many tips and tricks to prepare for winter, but it’s not often we talk about what to do when winter melts away. All of that slush, mud and water can cause damage to our homes and property. Water in unwanted areas can cause flooding, and mold which can in turn lead to air quality issues. Accumulated snow in unwanted areas can also be a hazard not only to your family and limit mobility, but it can also threaten integrity of your roof, foundation or windows. Here are a few tips to help make the transition from winter to spring go a lot smoother, and avoid any potential damage. Walk around your home and look for any areas where melting snow may have trouble draining. If you are comfortable doing it yourself, clear any debris or snow from your gutters. Otherwise you may want to contact a professional. You’ll also want to make sure all of your downspouts drain away from your home. Remove the snow from your stairwells, downspouts and basement window wells. These are areas you don’t want water to accumulate so keep shoveling that snow elsewhere. If you haven’t invested in a window well cover, look into the options available at Windowell Expressions before April brings rain showers that could damage your basement. A window well cover will keep rain and snow out of your window well. You can also caulk the perimeter windows to keep any water from leaking in. Of course, you don’t want to seal your basement windows so you have an escape in case of emergency. Clean snow away from all of your doors and windows to prevent flooding or leaking water. This includes basement window wells that don’t have a cover, and may have filled with snow. Shovel snow and ice from the perimeter of your home as best as you can. 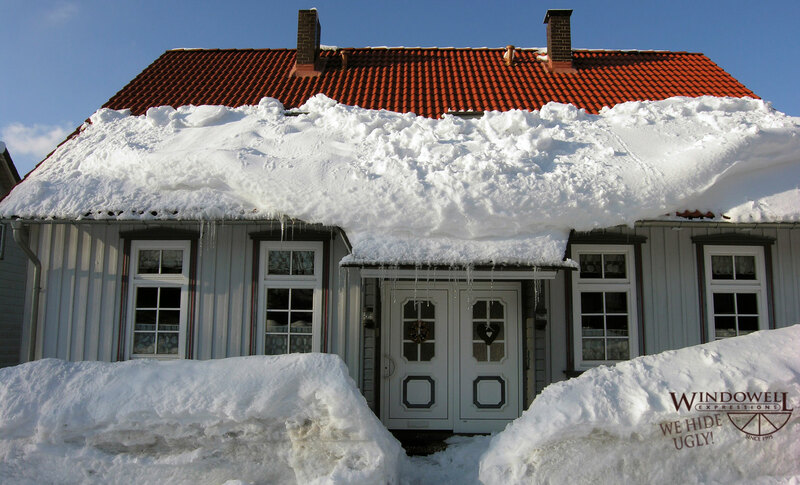 If you can, carefully remove heavy snow that has accumulated on your room to prevent your roof from collapsing or leaking. Shovel and clear your street cutters to help melting water travel away from your home as smoothly as possible. If water does get in your home, act quickly. Dry everything that got wet to avoid mold, mildew or any further damage. It’s also a good idea to pay attention to your local weather so you can anticipate heavy rain or flash flood warnings. If you do have problems with water in your home, this spring you may want to consider adding or increasing the slope of the ground away from your home. You may also think about adding gutter extenders so water drains further from your home. If you have problems with your window well accumulating water, make sure there is a good amount of gravel in the wells for better drainage. Again, adding a window well cover will help to keep water from accumulating in your well. As another preventative measure, it is wise to keep a working sump pump on hand in case the worst should happen. This entry was posted in Blog and tagged Foundation Drainage, Window Well Clear Covers, Window Well Covers, Window Well Custom Grates, Window Well Foundation Liners, Window Well Liners, Window Well Standard Grates, Winter Snow Melt on February 25, 2016 by admin. Decorate Your Windows for Valentines Day! Show your love this Valentine’s Day with windows! Valentine’s Day is right around the corner, which means it’s time to start coming up with ways to sweep your sweetheart off of their feet. Don’t have an idea for a gift or celebration yet? Not to worry. We have a few ideas for you that involve the windows around your home! Whether you want to express love for your spouse, sweetheart, friends or children, these ideas will help while also making your home feel festive. Why not try out a hands-on project? These ideas are simple and will help to set a tone of love in your home as Valentine’s Day approaches. First, get some colored paper and cut out hearts. Next, spruce up the hearts by punching out various holes with a hole puncher. Loop some string through one of the holes and hang the hearts up in front of a window! You can also hang the hearts up in your window well to add a little bit of festivity in an unexpected place. For an example of the project, click here. This is just one example of many fun and simple Valentine’s Day crafts. Whatever you decide to do, imagine how surprised your Valentine will be when you pull back the curtain or draw the blinds to such a lovely spectacle. If you are looking for a festive craft that’s a little more ambitious, how about trying your hand at giving life to an old window pane. Look for vintage window panes from antique shops, garage sales, or perhaps you have one laying around your garage. You can give it new life and use it to bring the festivities of Valentine’s Day into your home. Once you have your vintage window pane, try making a decorative garland out of hearts and stringing it across the windows. You can see one example here. You could also make a banner to string across your window pane. Make it out of paper or burlap with a variety of sayings. Why not paint or print “love” or “be mine” on the banner! If you need some inspiration, check out these examples here. Maybe you’re not really the crafting type. Don’t worry, you can give a gift that will continue to give for a lifetime. This is a gift that also looks great no matter what; no decorating necessary! If you know your Valentine has expressed interested in getting a window well liner, Windowell Expressions is here for you. Valentine’s day is a great time to take the plunge and get your love a gift that will increase the value of your home with a beautiful view from your basement windows. When you invest in a window well liner from Windowell Expressions, you get quality. Give Windowell Expressions a call or come by today! Happy Valentine’s Day! This entry was posted in Blog and tagged Window Well Clear Covers, Window Well Covers, Window Well Custom Grates, Window Well Foundation Liners, Window Well Liners, Window Well Standard Grates on February 13, 2016 by admin.